Flat 2 is the one bedroom accommodation we have is in a purpose built block which has four flats. It is located in on Lansdowne Road by the Lansdowne Roundabout which is on the Bournemouth University bus route is or about a 25 minute walk to the Bournemouth University or Arts University College Bournemouth. 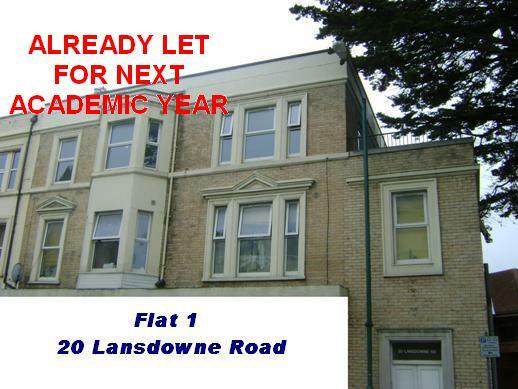 These are two bedroom furnished flats and Flat 4 is a 2 bedroom maisonette on two floors with a large terrace balcony. Each flat has an open plan lounge/diner and kitchen and double bedrooms. They all have good size rooms and newly fitted kitchens with washing machine and central gas heating on a combi boiler. These flats consists of an open plan lounge/diner and kitchen with one or two double bedrooms and shower rooms. They come with a fully fitted kitchen with washing machine and modern furniture including leather sofas, glass coffee tables and matching furniture in the bedrooms.